After "Hello Pig", it seemed like Levellers were on a road to nowhere. It wasn't unusual for the press to throw a derogatory review their way, but for the first time the fans simply held their heads down in shame and hoped it was a temporary blip. But looking in the Levellers camp it was clear that things had changed. Band members had settled down with partners and the priorities had changed from the band to the children. The once thriving travelling community had branched off into easily divisible couples and family units. 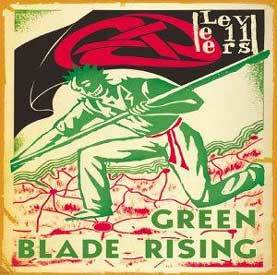 "Green Blade Rising" sees the band returning to what they do best and looking to the classic Levellers album "Levelling The Land" for inspiration was a wise move. Back in the early 90s the band were as out of step as they are now and for this writer the choice of wearing a Levellers tie-dye T-shirt on the last day of term instead of the regulatory Rage Against The Machine or Nirvana regulation uniform meant I was this close from a good hiding. I also recall the day of May 1st 1997 at a Levellers gig the night that the Tories were kicked out before realising 6 months later that Tony Blair basically was Thatcher in drag. Still I repeated the mantra of "There's only one way of life and that's your own" and each successive Levellers album has soundtracked my life. With the exception of "Wild As Angels", "Green Blade Rising" is very much a complete album rather than a collection of singles and fillers which admittedly the band have suffered from of late. Mark Green's abstract lyrics have always described a lifestyle rather than approaching specific events and it's on the aformentioned "Wild As Angels" and "Aspects of Spirit" which they really touch home. Looking at life from the eyes of someone with his best days behind him, the archetypal old man in a pub recalling his better days and looking to the infrequent highlights of his present situation but realising he's still young at heart. And it's that classic pub singalong where the Levellers excell on "Four Winds" and "Fallen From A Tree" - the ale flows freelily while Victorian urchins jigg to a sole drum and violin solo. As the band grow up and settle down it only means that their fans will be bringing a whole new generation of free thinking community spirited along with them for the forthcoming tour. And that ultimately is where the Levellers lie - a band who can bring together a whole community bridging generations, religion and class to a night where we all drink, get merry and celebrate the fact that we can all step outside of normal life and be free if only for one night.